I enter, sign up, and try my darnedest to win prizes... any prize for that matter! Raffles, contests, and drawings are my weakness. Your kid is selling raffle tickets to go on a class trip, come see me, as I am a huge sucker! Your church is having a random drawing for a quilt, to add to the building fund...oh, yeah...come see me! Enter to win tickets to a local concert, sporting event, or back stage passes...yup, I totally enter or call, as many times as possible! Not one single prize has ever ended up in my hands! But...we won, this time! 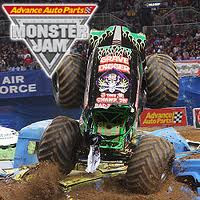 I say "we," in that it is a family 4 pack of tickets to see Monster Jam! I entered a drawing to a local magazine and was contacted by email that the tickets had been mailed out! I had to have Mike read the email to make sure that it was legitimate, and that my name had actually been drawn! What is REALLY awesome about this is that Mikey, has been dying to go for the last two years. Between Mike's work schedule and the cost of 4 tickets, for our family; we just couldn't pull it off. Mikey's best buddy Mason has been twice, and when Mikey would see the pictures, he would smile and just love the fact that Mason saw the trucks up close! Mason and Mikey share a love of the toy Monster Trucks, and have both acquired a small collection! We told the boys that we had tickets and would be going on Friday! Ryan and Mikey, jumped up and down, and wanted to know how soon we could leave? So, to say that they are excited is an understatement! Cant wait to take the boys!